Happy 12.12.12 at 12:12 PM Day! A couple of months ago, I won a Show Us Your Mustache contest from Authentique. I guess they liked my work that they saw on my blog because sweet Miss Emily invited me to be a guest designer this month. I LOVE working with Authentique products so I jumped at the chance. This card is a bit unique in that it starts out looking like a matchbook. 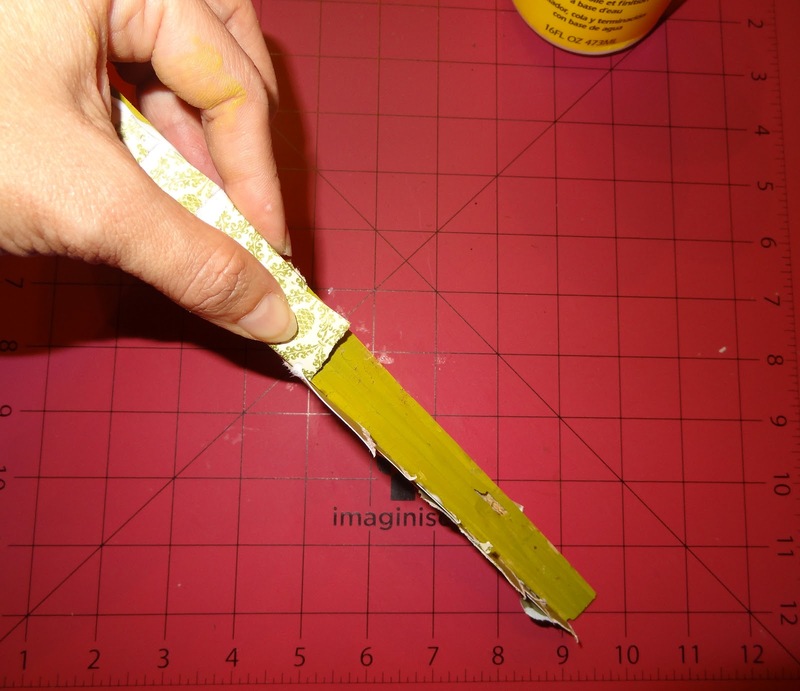 I cut it using my CAMEO and a Lori Whitlock cutting file. 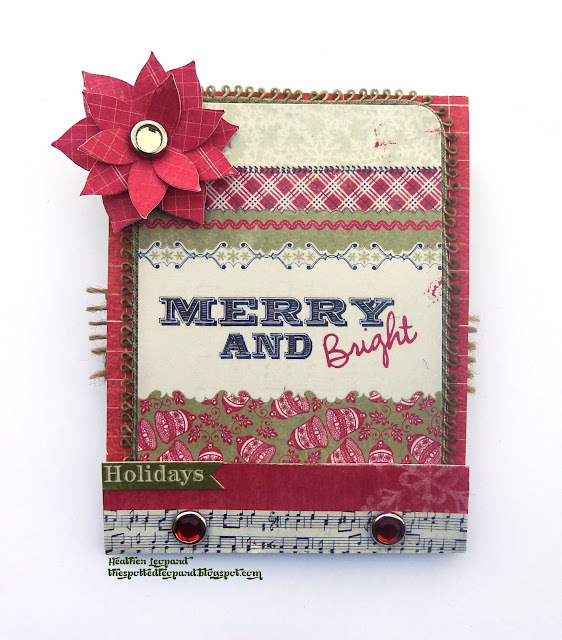 The front is decorated with a simple sentiment, ribbon, poinsettia and bling. The front flap is tucked in and when you pull it out, it reveals a pocket on the inside. 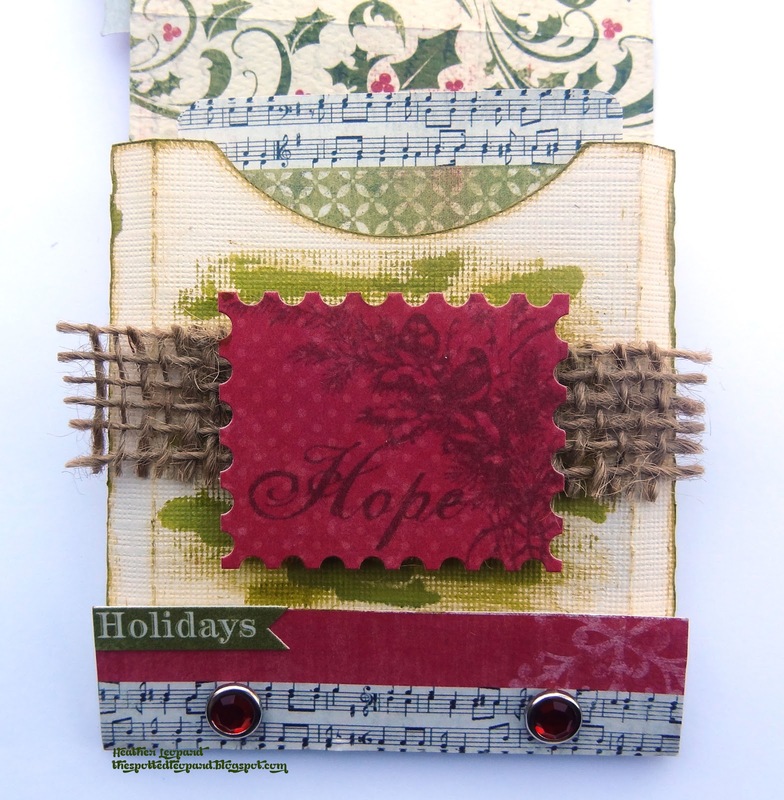 I added some burlap under the Hope sticker but it didn’t pop off the cream pocket so I went back and added green paint. 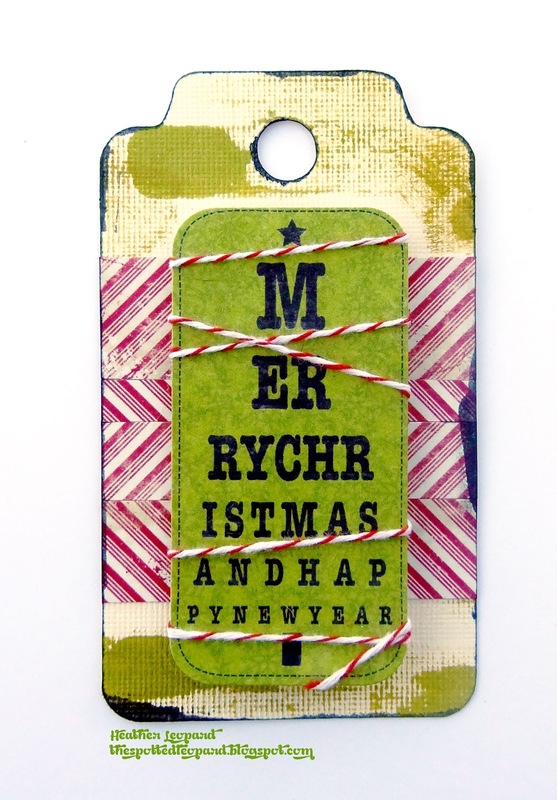 I created these tags to be the focal point for several gifts I will be giving this year. After cutting the tags, I used mists and paint to dress up the base of the tags. 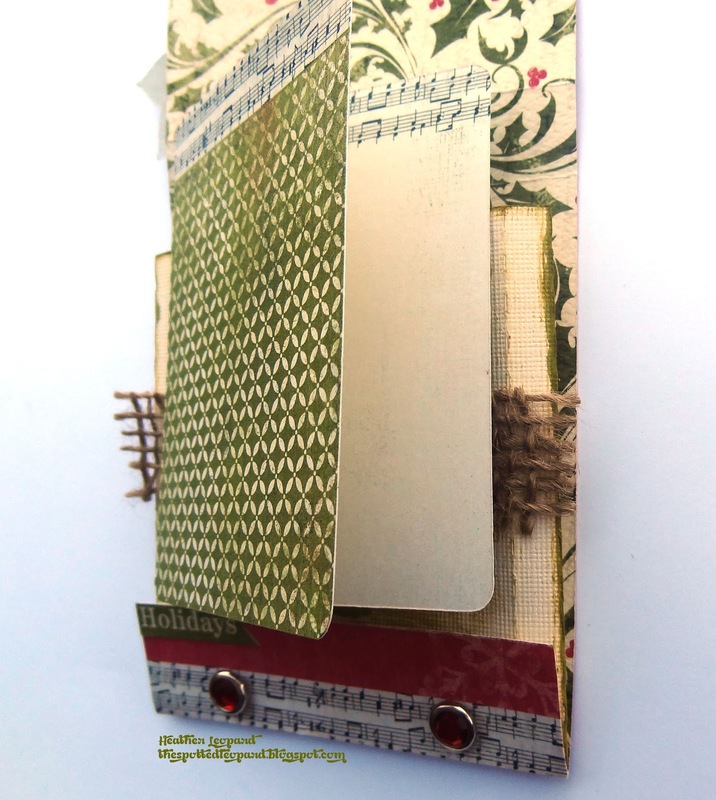 I then used a combination of fibers, paper and stickers to create little “scenes” for each card. The papers and stickers in this collection did all the work and demonstrate the reason for the season on their own. I cut this tag straight from the paper. I just love the music sheet and cardinal. 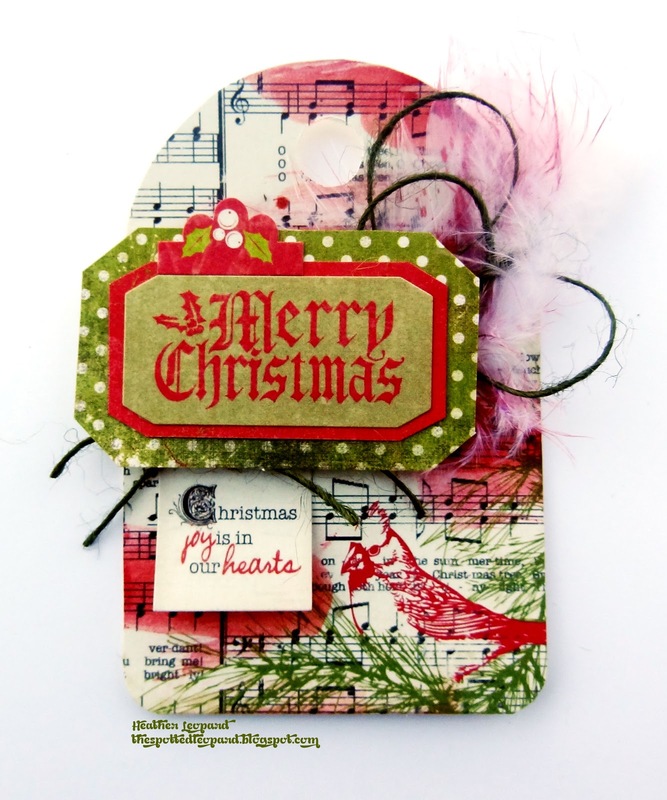 I added some white feathers, twine and the sentiment and voila! 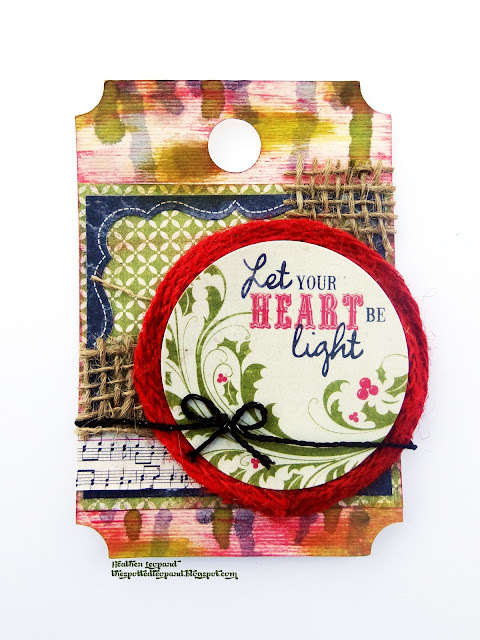 I was trying to go for a glowing light effect with this card, like when you see lights on a tree from a distance. I simply dripped mist on it by removing the spray nozzle and tapping it to the top of the card. The mist dripped down to give this effect. I added some red paint to the base once dried. I topped it off with paper, a sticker frame, burlap and then I addedred canvas ribbon around the sticker and a black bow to make the sentiment pop. 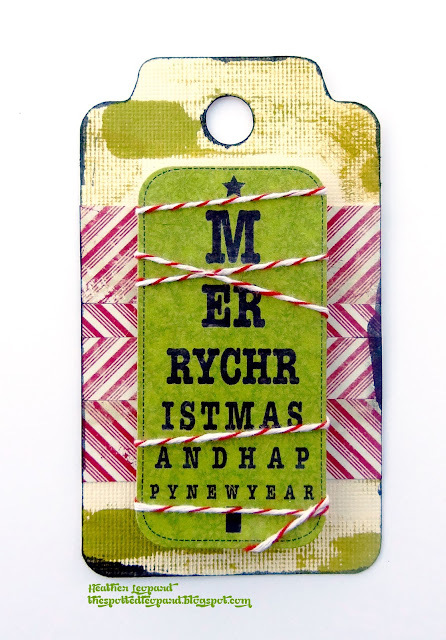 This is a simpler card but it’s one of my favorites. I just added some paint to the base and then I cut strips of the candy cane looking paper from the 6x6 pad and alternated the pattern to give it a chevron feel. I topped it off with the sticker sentiment wrapped in red/white striped twine. 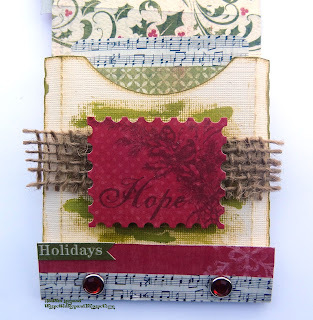 The paper from the 6x6 paper pad did most of the work for me on this tag. 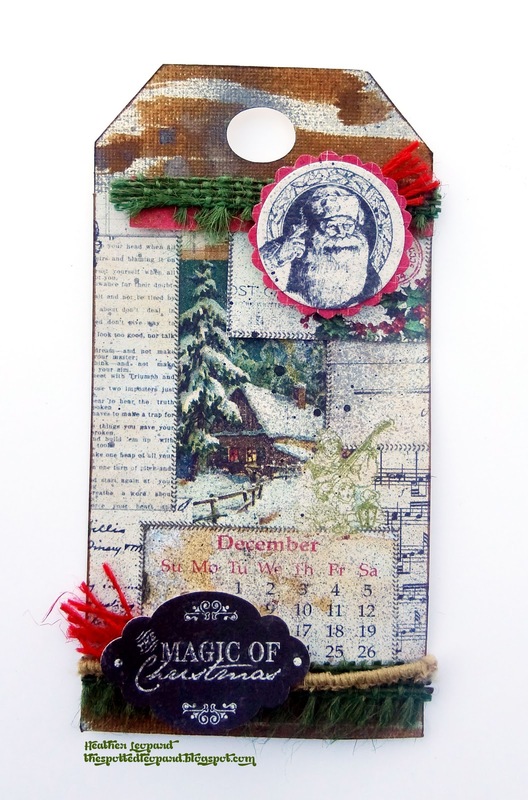 The winter scene and December calendar is my focal point with the Santa sticker. We all know the real meaning of Christmas but Santa is a good reflection of the Magic of Christmas. I decided that I needed a new set of Christmas trees for my mantle this year and I asked (begged) my hubby to help me out with them this year. He cut 8”, 10” and 12” trees out of particle board for me and I went to town decorating them. First, I painted the tree trunks with walnut ink and then I tore paper strips and layered them over each other, starting at the bottom of the tree. I then cut poinsettias with my CAMEO and added popped up stickers to the centers that say Peace, Joy and Noel. I topped off the trees with accordion flowers. Ribbon and more stickers from this collection. I have gotten so many compliments on these trees and they were so easy to make! 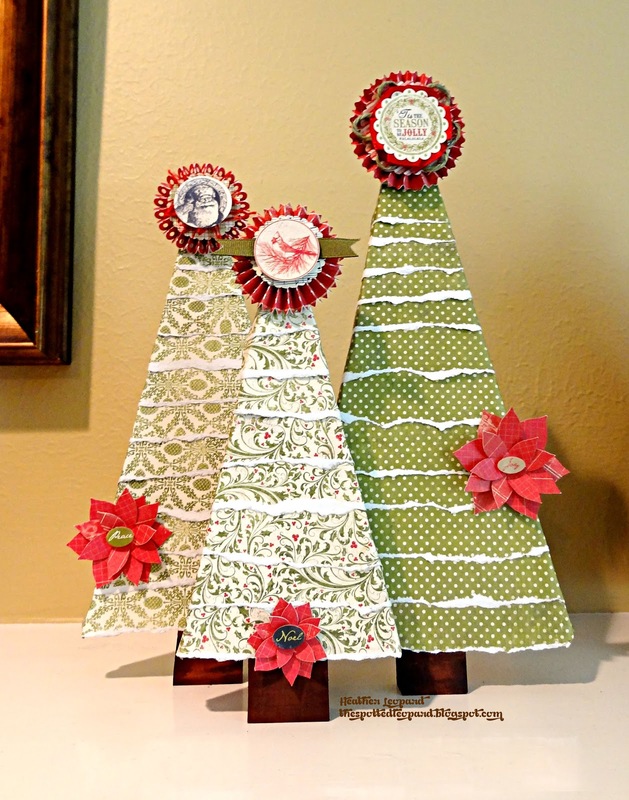 Here's a quick Christmas Tree Tutorial so you can make your own. Step 1: Buy wooden Christmas trees at your local hobby store or get your hubby to cut you some! Mine are 8", 10" and 12". Step 2: Gather your supplies. 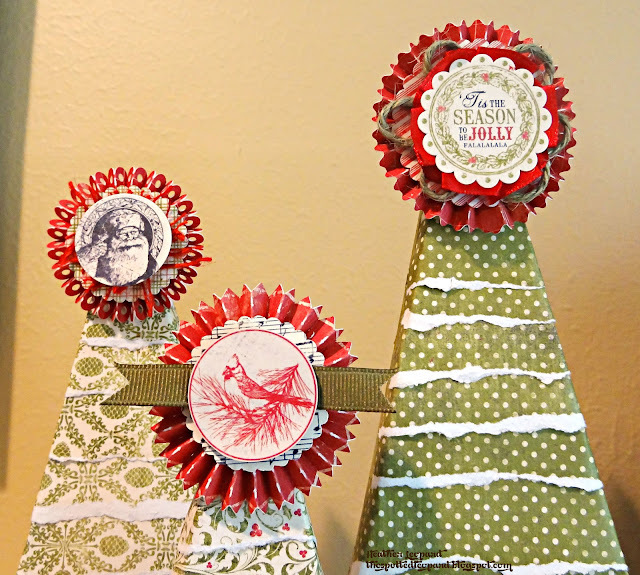 I used Mod Podge, ribbon, twine, green paint and walnut ink, 3 different sheets of pattern paper for the trees, plus additional coordinating papers to make the poinsettias, rosettes and sticker bases. Oh and speaking of stickers, you'll need those too. 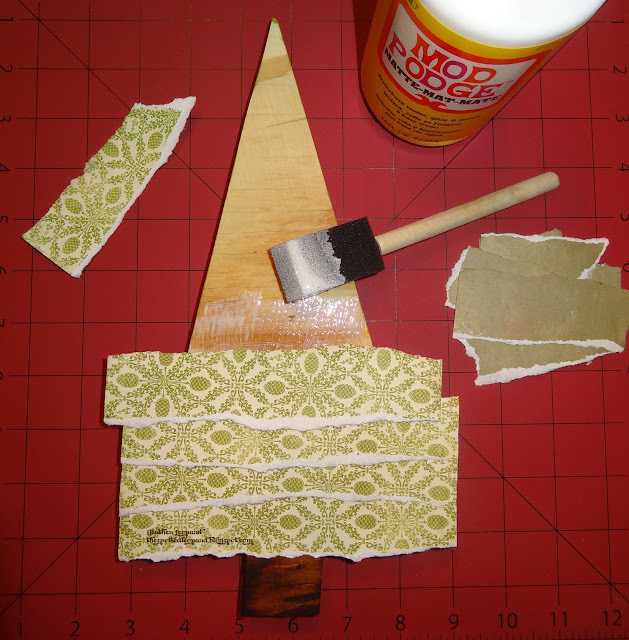 Step 3: Paint the edges of your tree green in case it shows through any paper gaps. Paint the tree trunks brown. 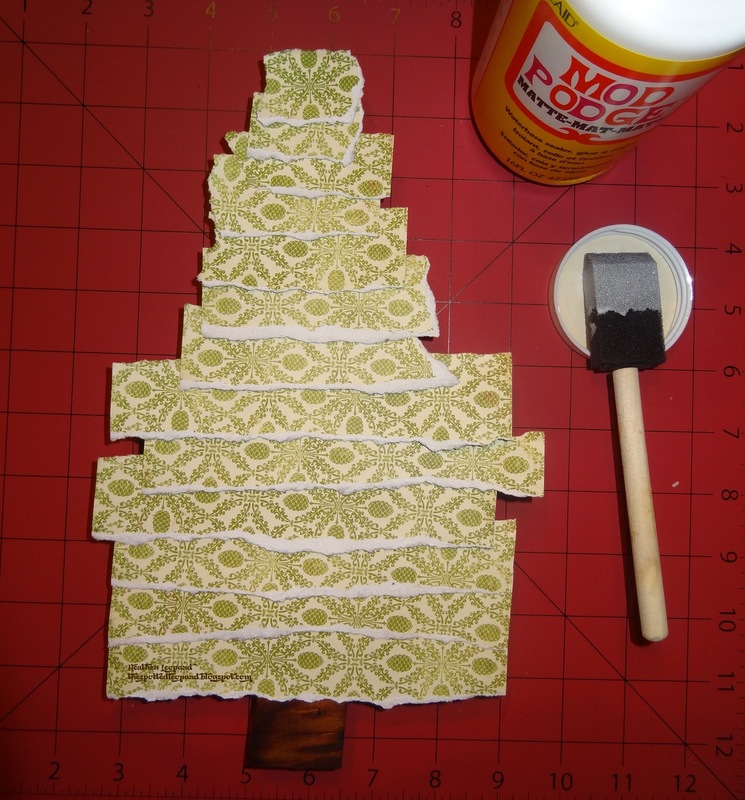 Step 4: Tear your paper into strips (shown above and below) and start layers them over each other, leaving lots of paper over the edges so you can eventually fold them over to cover the sides of your tree, Don't worry about covering the back of your trees, unless you're putting them somewhere someone will see them. Step 5: Fold the edged over the side for a nice, clean finish. 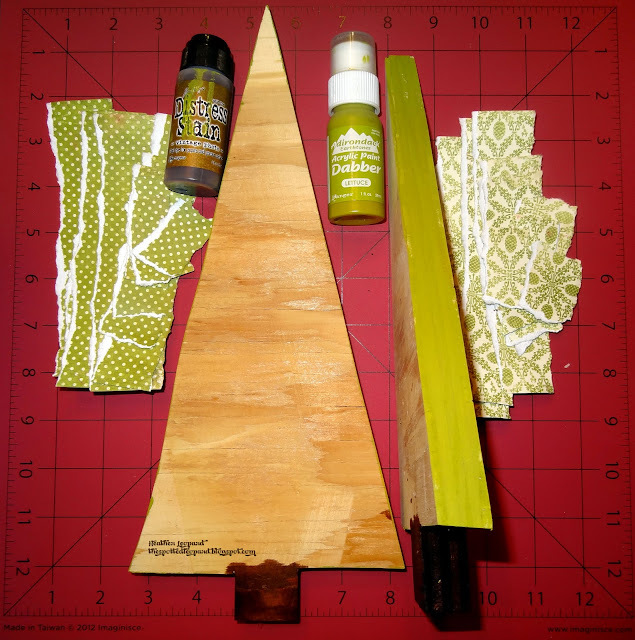 Step 6: "Trim your tree" however it suits your fancy. I added rosettes at the top and poinsettias at the bottom. Step 7: Display in your home and get ready for oohs and ahhs from your guests. Thanks for stopping by today. Make sure to visit the Authentique blog and say hi to me over there too as well as check out what their design team is up to! congrats to you -- you ROCKED the creations girl! CONGRATS on the GDT spot!! That is AWESOME!!!! I love love love love everything!!! Absolutely GORGEOUS!!! I am IN LOVE with those trees!!!! Love the tags and the trees ! Oh my1 You really have a gift with paper and design! I was truly inspired with the photo's you posted. Thank you! I needed that! very nice post really impressive layout, thanks for sharing. these are adorable! now I just need to make my husband watch some youtube videos or something to learn how to make me some trees to decorate! I love your little trees! Huge congrats on guesting with Authentique!!! These projects are so awesome!!! I love those Xmas trees!! !